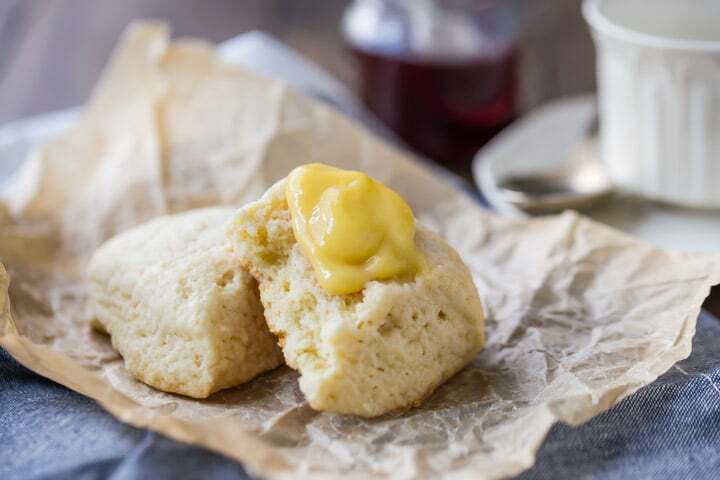 A basic scone recipe for tender, moist, butter-y scones that are so quick and easy to make! Perfect as-is with just butter and jam, or you can get creative and add fruit, spices, or chocolate. 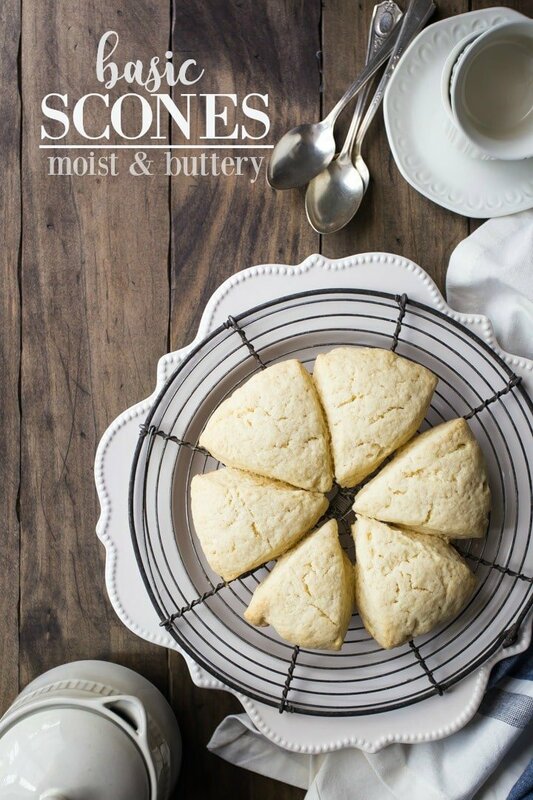 I have been wanting to share this basic scone recipe for so long! I’m so happy to have finally gotten around to it. Scones are by far my favorite breakfast treat. I love how buttery and tender they are, and they’re so versatile! You can add all sorts of fruit, spices, or even chocolate to them, and really let your creativity shine. Some of my favorite jazzed up scone recipes include these Raspberry Rose Scones, Double Chocolate Scones, and Cinnamon Peanut Butter Chip Scones with Maple Bacon Glaze. There’s just nothing better than a freshly baked scone, warm from the oven, with a hot cup of tea, coffee, or cocoa! 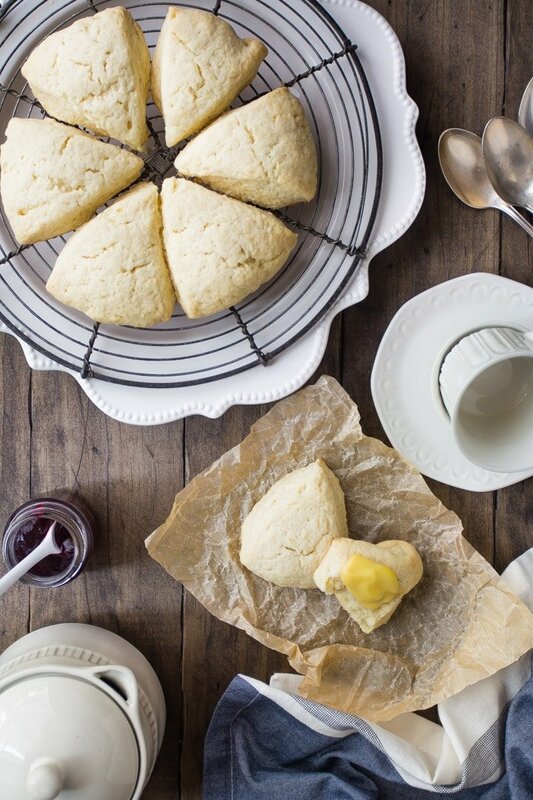 And with this basic scone recipe, you can’t go wrong. They’re so quick and easy to make, and so moist, soft, and delicious. If you’re not already familiar with scones, they’re a little pastry that’s usually served for breakfast or brunch, but they make a really nice afternoon snack as well. In the UK, scones come in a circular shape, and they’re light and fluffy. They are basically the same thing as what Americans know as a “biscuit.” If you are looking for a tall, fluffy biscuit, then you should definitely check out my Southern-Style Buttermilk Biscuits recipe. It’s pretty much exactly the same as an English scone. Here in the US, we mostly make our scones in a triangle shape. They’re sort of like a muffin, but more dense. Even though they aren’t really fluffy, they should never be dry or hard. I love a soft, moist, tender, buttery scone, similar to what you would get at Starbucks (but better!). It should almost melt in your mouth. And that is exactly the result you’ll have when you bake up a batch of these basic scones! One of the reasons I love scones so much is because they’re so quick and easy to make. You can literally throw some flour, sugar, baking powder, and salt into your food processor, work in some butter, stream in the cream, shape the dough, and bake them up in less than a half hour. I never used to make scones in the food processor. I was convinced that it would overwork the dough and make the scones tough. But when I developed the recipe for these Petite Vanilla Bean Scones, I really had to tinker around a lot. They are a Starbucks copycat, and the scones at Starbucks never have that rough, nubbly texture on the outside. They have a much smoother appearance and the mouthfeel is also very smooth and almost creamy. So I got to experimenting. I made so many batches of scones! After many tries, I had the perfect food-processor scone recipe. It’s tender as can be, moist, and buttery tasting, with just a hint of sweetness. And I love how smooth and pretty they bake up. This is my new favorite way to bake scones; from now on I will always start with this basic scone recipe, and always use my food processor to make the dough. Just be really careful not to overbake your scones. If they stay in the oven too long, they could come out dry or hard. That is not a good scone experience. You want your scones to be the best they can be, so pull them from the oven when the centers are set and they’re just barely beginning to turn golden on the bottoms. This is a very basic, plain scone recipe. You can totally get creative and add anything your heart desires. Chopped nuts, berries, spices like cinnamon or ginger, citrus zest, or chocolate chips would all make delicious add-ins. You can even ice them with a powdered sugar glaze, or drizzle them with Chocolate Glaze. But they’re just as delicious as-is, with a little soft butter or jam. Or, my favorite way to top them: Homemade Lemon Curd. So yummy with a cup of tea, coffee, or cocoa! Especially when they’re warm. Read on for instructions on how to re-warm scones. CAN SCONES BE MADE AHEAD? One of the things I really love about this recipe is that the scones can be made ahead. They keep very well for several days in a zip-top bag at room temperature. If you think they’ll be hanging around longer than that, just pop them into the fridge. They should last at least a week or two in there. Or you can freeze them for several weeks. Place them out on the counter to defrost and then re-warm them. The best way to re-warm these basic scones, in my opinion, is in the microwave. They only need a few seconds. On my microwave 15 to 20 seconds is perfect. You don’t want to overdo it, because the microwave tends to make things chewy, but if you only keep them in there long enough to just get warm, they’ll come out moist, steamy, and tender. If you don’t have a microwave or prefer not to use one, then they can be warmed in the oven on the lowest possible temperature. It’s best to wrap them in foil first so they don’t dry out. Again, don’t leave them in too long! They’re already baked so you don’t want to re-bake them- just warm them gently. 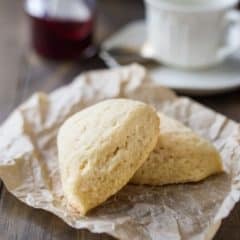 I hope you’ll give this basic scone recipe a try! I think it is going to become a favorite for you too. If you do, drop me a comment below, and let me know what kind of add-ins you used (if any), and how they came out! Place the flour, sugar, baking powder, and salt in the bowl of a food processor, and pulse to combine. When the dough has gathered itself into a ball, turn off the food processor and divide the dough into two equal portions. Bake the scones for 14 to 18 minutes, or until set in the centers and slightly golden on the bottoms. Serve warm, with jam and butter, clotted cream, or with lemon curd. Hi Allie. How thick? 1/2″ (12.7 mm) or 1 1/2″ (38.1 mm)? Thank you, A. Hey Alberto! It says it in step 7: “Flatten each portion of dough into a disc shape, about 1 1/2-inches thick.” If you want to see what that looks like, there’s a video just above the recipe card. Hope that’s helpful! I love cream scones and your recipe is perfect! I’d love one topped with lemon curd! Scones are my weakness! These look AMAZING! This is excellent! So easy to add things to! My pleasure Heena! So glad you enjoyed. Thanks for the good feedback! I have not tried this recipe yet. My husband and I are involved in a Steampunk festival. We are having an iced tea social and thought I would give these a try. Perfect! Have fun at the social and I hope you enjoy the scones! Yay! I’m so glad! Thanks so much for the good feedback Spandana! Scones are so good, this basic version is perfect! Scones are such a wonderful breakfast treat! Would love to make a gluten free version! That is totally do-able Lindsay! This recipe would work really well if you just sub the flour for a gluten-free flour blend. I have some favorites listed at the end of this post: Why Use Cake Flour? oh I love that these are just a basic scone-it makes it so easy to use this as a base and play with it! Could I add dried fruit to this basic recipe? Mine did not come out very well. They didn’t rise and turned into these pancake shapes…..what did i do wrong? Hm, that is very odd- they should nearly double in size as they bake. Did you preheat your oven? Did you by chance forget to add the baking powder? Or could your baking powder have been old and past the expiration date? I don’t have any heavy cream; can I use sour cream or yogurt as a substitute? Awesome! I was just wondering what I could substitute for the cream. I just made a batch using Greek yogurt instead of cream, and they are wonderful. I made half plain and to half, i added raspberries. Both are delicious, crumbly and delicate flavored. This is a keeper!! Hooray! That’s wonderful! I’m so glad you like the recipe. It’s definitely a favorite for me as well. Greek yogurt is a great sub for cream! These were so good! So easy to make and my boyfriend and I both loved them. I don’t own a food processor but I softened the butter a little bit and used a hand mixer and it worked well, just had to use my hands to do some of the mixing and roll it into a ball of dough. We topped them with some peach jam. Will definitely use this recipe again! That sounds fantastic! Peach jam is so perfect for this time of year. So happy the recipe worked out well for you Brooke, in spite of not having a food processor! Thank you for the nice feedback. Love this simple scone recipe and have written down and placed the recipe inside my cupboard for easy access!! I make your recipe into just 8 BIG scones😁. I do like to add extra yummies my favorite being dried cranberries, white chocolate chips and macadamia nuts whole! Lastly I put some heavy cream on the top and sprinkle with cinnamon sugar. Definitely my next Strawberry Shortcake biscuits! It’s my pleasure Penny! I’m so glad you’ve been enjoying the recipe, and I love to hear how you’ve made it your own. Thanks so much for reading and for the positive feedback! Hey Robin! You can do it the old-fashioned way, with a pastry blender, but they will have more of a “rustic” appearance. If you don’t have a pastry blender, you can cut the butter in with two knives or just use your fingers. Hope that’s helpful! I would love to try these with chocolate chips next time. Do you have any recommendations for how much I should add? Hi Emily! I think that’s really up to your own personal taste and how chocolate-y you’d like your chocolate chip scones to be. I’d start with a cup and see how that looks. 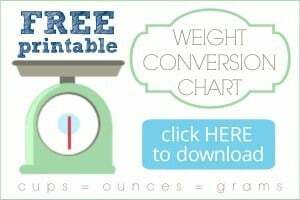 You can always add more if needed! In my state of pregnancy I read the recipe wrong, three times! I added 1 1/3c sugar. I couldn’t figure out why they were melting in the oven! I feel so dumb, but discovered a new breakfast cookie recipe. Lol thank you for the amazing scones. Once I did it right they turned out perfectly! Lol that’s so funny Jerri! Pregnancy definitely did a number on my brain too, I totally understand! So glad you finally got it right though! Thanks for the positive feedback. Looking forward to trying these with some blueberry jam I just made. Would it work to make the dough and shape the scones the evening before baking them by keeping the dough refrigerated on a cookie sheet? Hi Raj-Ann! I’m afraid I wouldn’t recommend it. The baking powder starts to activate as soon as it becomes wet, so it’s best to get them right into the oven once everything is mixed up. Good luck and I hope you enjoy! That blueberry jam sounds fantastic! I just made a different recipe that is similar to yours but calls for 1 tsp baking powder to 3 cups APF. The flavor had that baking powder taste and aftertaste. I want to try again with your recipe. But I noticed yours has a higher ratio of baking powder to apf — 1.5 tsp baking powder to 2 cups APF — compared to the recipe I made previously. I’m afraid it will have an even stronger baking powder taste, which I don’t really like. Can you tell me if that is just how a scone is supposed to taste? I’ve never eaten one before until I made my first batch today. The texture is so lovely but maybe scones are just not for my tastes? Hi Memly! If you dislike the taste of baking powder, try substituting yogurt or buttermilk for the cream. Baking powder is a base, so it can sometimes have a bitter or soapy taste. The natural acidity in buttermilk or yogurt will neutralize the pH and balance out the flavor. Hope that’s helpful! Did she perhaps use baking SODA instead of baking powder? It seems to me that baking soda would be a more likely cause of the taste she didn’t like . . .
And the scones I made were very good! I needed a bit more cream to get the dough moist enough (because it’s winter and the flour was very dry). I’m not sure what she did but thank you for the nice feedback! My pleasure Ariane! I’m so glad you liked it. Thanks for the comment! I just made these and I did exactly what the recipe says and decided it in 2 equal portions then tried to flatten it. There is no way when devising it to get 6 scones from one half of the dough. They were less than an inch in size each. They haven’t come out of the oven but I’m not expecting them to be normal scone size. They are mini!!! Should I not devide the dough? And only get 6 total scones? Should I double the recipe to get 12? Hi Elizabeth! Your scones will be on the small side if you divide the dough in half. You can see how big they come out if you watch the video just above the recipe card. If you want jumbo scones, just make one big disk of dough and cut it into 8 equal wedges. They’ll need about 18 to 24 minutes in the oven. Hope that’s helpful! Hi Allie. My wife is European and really dislikes Anerican pastries, cakes and pies. Whenever we can get to a Publix grocery store, we stock up on their lively scones. They offer sugar glazed and plain but they are a bit expensive. At 4 dollars for 8 scones, they don’t last very long, so we grab 3 or 4 boxes and freeze till we need them. Your recipe has made me a happy camper and a proud Baker. They are very easy as well as tasty. Thank you so much for taking the time to post these little babies. Very yummy!!!!! I’m so happy you and your wife have been enjoying the recipe Michael! I tend to prefer less sweet baked goods as well. Thank you so much for the positive feedback, you’ve really brightened my day! If I had known they were this easy to make I would have been doing so long ago; thanks so much! Do you think margarine or cold coconut oil can work instead of butter? Hey Dunori! So happy you like the recipe. I haven’t tried margarine or coconut oil myself, so I can’t say for sure, but it sounds like it should work. If you end up giving it a try, will you let me know how they come out? Made these again yesterday. I added the zest of an orange and they are still fantastic. The BEST scone recipe in my opinion……light and fluffy. Wish I could give 10 stars. Thank you again. Thank you for the great review! So happy you are enjoying the recipe. I just made them this week too- with orange and cranberries!